Cannibal Holocaust (1980) – dir. Ruggero Deodato | Films Like Dreams, Etc. It’s hard to pinpoint another film whose unflinching brutality and gruesomeness is as effectively captured on film than Ruggero Deodato’s Cannibal Holocaust. For comparison, however, I often keep coming back to Elem Klimov’s grim war depiction Come and See. Both films employ a sense of hyperrealism in its technique, the likes of which I have rarely seen, even in the most ambitious types of cinema. Cannibal Holocaust, however, is probably most well-known for having the bulk of its fame riding along its controversy over unusual filmmaking decisions deemed immoral and inhumane. Even the sheer mention of the film’s name strikes disgust into the hearts of those familiar with its content. I think there is definitely more than meets the eye, though. This is one of those unique works of art that prove that a film of this kind not only succeeds at bringing to light what is so hard to accomplish, but should probably never be attempted again. My first impression upon watching this film is that it came across like a sort of Heart of Darkness of horror movies. Like protagonist Marlow in Conrad’s novel, viewers are submerged into a vastly foreign world, with rituals and tendencies far beyond any trace of familiarity. As I predicted, the film soon ran in a course similar to that of the novel’s message: the boundaries of the civilized/primitive begin to blur, and the visitors’ follies soon land them in a far more gruesome fate than they could have imagined. The film forces us to try to comprehend who exactly the real savages are in such circumstances. Though this plot is rather typical and – shall I say – predictable, the way it is utilized in this film is terrifically gripping and terrifyingly profound. From the beginning, viewers are reminded of classic horror movie convention, where a group of characters enter unmarked, unfamiliar territory; immediately, we know bad things are about to happen. However, once a coatimundi is captured and sliced open right on screen, it’s evident that this is something completely out of left-field. The found-footage style of this film – particularly in its final third – is often cited as being an influence upon more recents trends, as seen in The Blair Witch Project. I would argue, however, that the technical decisions made with cinematography in Cannibal Holocaust is much more terrifying. While the violent, barbaric imagery of this film certainly plays a part, it is heightened by the fact that the film does not frequently try to assume an audience while capturing these moments. It feels incredibly realistic, as if every moment of savage cruelty is recorded for sheer pleasure. This alone is incredibly unsettling. Another effective mood-setter that surely must not go unnoticed is the amazing musical score from Riz Ortolani. The opening shot of a birds-eye view from a helicopter flying over the seemingly endless forest is punctuated by this soundtrack, grasping one’s attention right from the start. It’s hard to believe that such a lovely, tranquil opening could lead to such brutality that tarnishes the name of Cannibal Holocaust. Nonetheless, the most chilling moments of the film are heightened by this score as well. Their melodic tones clash harshly with the intense, macabre settings and atmosphere of the film as a whole. It also contrasts with Hollywood tendency of implementing intense, hyperactive soundtrack to the climactic moments of horrors and thrillers (a lá Psycho and Halloween). This alone exemplifies how this film is just a cut above the rest, surely ahead of its time. I will frankly admit that one of the major issues that I’ve had with the film before – and even after – my viewing was with the unsimulated animal killings filmed for the sole purpose of screen depiction. From a subjective standpoint, the murder of animals for the primary purpose of art or entertainment is not only rather inhumane, but also frustrating that such means are exploited to make a point. This frustration is heightened by the fact that the gore effects for the fake human deaths are extremely effective at being terrifying on their own; in this sense, it seems almost unnecessary to kill real living things with such accessibility otherwise. However, I have grown to accept the truly ghastly effect such a decision has made on me as a viewer. I will always support creative freedom if there is indeed a message being sent out from such means of expression, and I do indeed think there is here. The explicit showing of these killings expands the sense of hyperrealism; while without such it may have been just impressive filmmaking, these real deaths further blurs the lines between fiction and reality, and the resulting effect is almost unbearable. In this sense, I am willing to set aside my personal beliefs to willingly praise the filmmakers for such ambition and compliance to ride the reins of brutality. I would be lying if I said that my initial viewing of Cannibal Holocaust wasn’t absolutely profound. I chose it for a midnight viewing one night and as a result, it took me about an hour and a half before I could even attempt to get to sleep. There are certain horrifying images in the film that just sear into your mind and refuse to let go. The abundance of blood, gore, and sheer brutality are accompanied with an inevitable shock factor, though I think the intention is much more than this. The film is truly one of the more grimmer depictions of its subject matter than I have ever seen, and it is thoroughly successful at projecting an explicit sense of humankind’s ugliness in its more impure form. While films that aim to scare its viewers are always good fun, the ones that stick in my mind the most are the ones that are a deeply unsettling, psychological mindfuck. Cannibal Holocaust is such a film. Moreover, it is only through the magic of cinema that such themes and images are able to reach their full potential. While I am unsure if there are many other films that paint as vivid of a picture as this one, I find it unlikely that this ambitious, unsettling, ugly breed of film could ever exist to such lengths again. 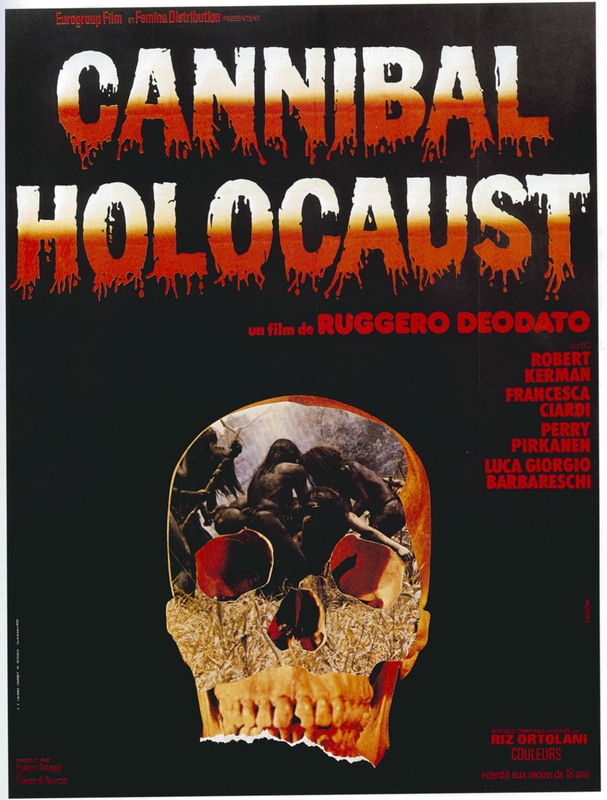 This entry was posted in Reviews and tagged 1980's, Cannibal Holocaust, horror, Italian, Ruggero Deodato. Bookmark the permalink. Be sure to check out the review for it on our site also – looking forward to further posts. I refuse to watch this. Ever. Nice review though.